JACKSONVILLE, FL – On Saturday, December 3, 2016, James Murtha & William Weir presented “FAME The Musical” at The Times-Union Center of the Performing Arts. This presentation is affiliated with the FSCJ Artist Series and sponsored by CHASE bank. This rendition of FAME was conceived and developed by David DeSilva and made its debut at the Coconut Grove playhouse. The more popular 1980 film and subsequent television series (1982-1987) entitled “FAME” was based on a student body at the High school of Performing Arts located in New York City. “FAME the Musical” transports theatre goers back to the year 1984, with music and dance choreography reminiscent of that era. “FAME the Musical” follows the personal stories of teenagers who are accepted into the High School of Performing Arts which is affectionately called “PA” by the students. As each one of them navigate what it takes to find FAME, they encounter very adult situations within their personal lives. During their time at the school; this group of students learned what it takes to navigate adult issues such as poverty, drug use, and bullying while maintaining passing grades. In addition, their creativity blossoms allowing the audience to get a glimpse of what kind of performer they will later become. Act I opens with the entire company belting out the song “Hard Work” while students acclimated themselves to their new environment, classmates and engage the faculty. Tyrone Jackson played by J’royce Jata gave an outstanding performance as a youth from the inner city who struggles with a learning disability. This young man brought a larger than life persona to his character garnering quite a bit of audience reaction during his scenes. He is a native of Jacksonville, FL and alumni of Douglas Anderson School of the arts. Other notable mentions were Eric Brandon Mota who brought the character of Joe (Jose) Vegas to life and won the hearts of the audience with a fiery Latino flavor. He majored in musical theatre at Sam Houston State University in Huntsville, TX and was listed as the dance captain He infused the right amount of humor to each of his scenes. His very animated personality combined with a high libido kept the crowd in stitches as he attempted to win the girl of his dreams, Carmen. Kris Roberts a graduate of New York University Tisch school of the arts majoring in drama immersed herself in her role as Carmen Diaz. Her outstanding offering brought the life challenges of her character to the forefront. Her superb portrayal left the audience cheering for Carmen, praying she will find the FAME she was so desperate to achieve in spite of her choices. As the musical closed the audience was brought to its feet offering standing ovations as Kris Roberts (Carmen) belted out her stirring interpretation of the title song “FAME” written by Dean Pitchford and Michael Gore. 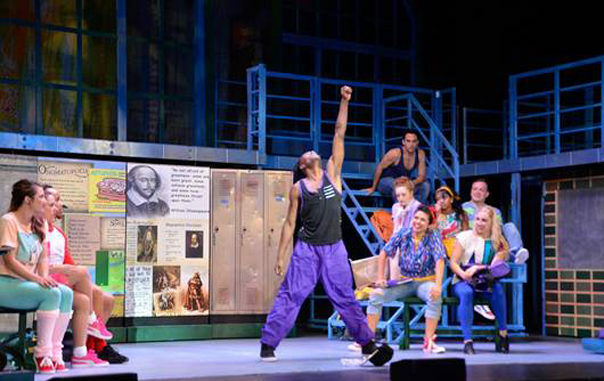 This stage rendition of “FAME The Musical” was unlike the film version and had no references to the made for television series. This story introduces audiences to new character actors with new back stories. This national stage presentation of this now cult classic entitled “FAME The Musical” is a must see!